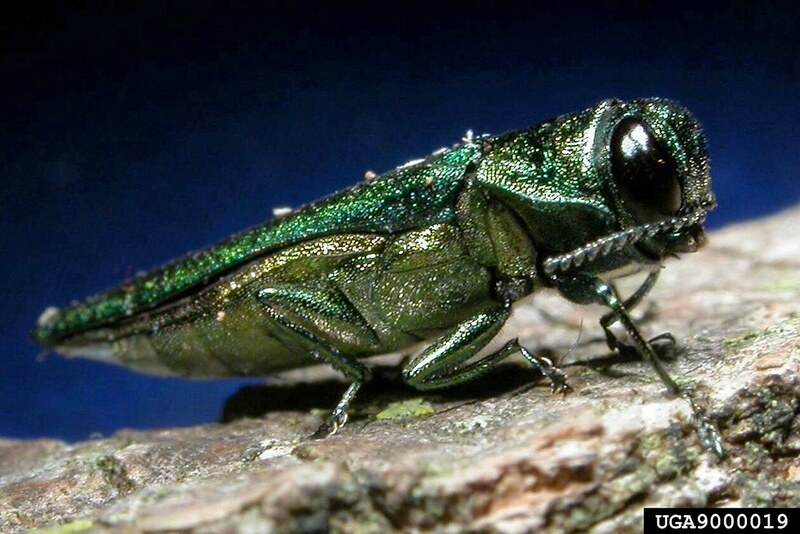 LITTLE ROCK — Forestry experts this week detected the emergence of adult emerald ash borer beetles, an invasive pest first detected in Arkansas in July 2014, near the Arkansas-Louisiana border. Chandler Barton, a forest health specialist with the Arkansas Forestry Commission, said he and other AFC experts were conducting field training for members of the Texas Forest Service in a field about halfway between Magnolia, Ark. and Shongaloo, La. Funnel traps established in the area had captured a number of the newly-emerged adult beetles over the past week, he said. Tamara Walkingstick, associate director of the Arkansas Forest Resource Center and associate professor of Forestry for the University of Arkansas System Division of Agriculture, said the adult beetles will likely begin emerging in southern Arkansas immediately, and in central Arkansas in about one to two weeks. The beetle has been confirmed in 10 counties in the state, including Saline, Hot Spring, Clark, Dallas, Ouachita, Columbia, Union, Calhoun, Nevada and Bradley counties. In September 2014, the Arkansas State Plant Board instituted a 25-county quarantine that banned the transportation of hardwood firewood, ash logs and ash nursery stock outside of the quarantine area. However, the quarantine allows for the transportation of ash logs to pre-approved facilities prior to what is known as the adult flight period, when the insect emerges and begins to fly. Peak emergence is projected to occur around May 3. Over the past year and a half, researchers with the Plant Board and other agencies have released several varieties of parasitoid wasps, in an effort to control the emerald ash borer population. Two of the wasps are “larval parasitoids,” meaning the wasp lays its eggs onto the emerald ash borer larvae; once the wasp eggs hatch, the immature wasps eat the beetle larvae. Another of the wasp species directly attacks the eggs of the emerald ash borer. Walkingstick said property owners who suspect they may have an infestation can use “soil drench” products such as Bayer Advance, or other pesticides that can be sprayed directly on the bark of trees. A full guide to invasive species and appropriate control measures can be found at http://www.uaex.edu/environment-nature/ar-invasives/default.aspx. For more information about the emerald ash borer, contact your local Cooperative Extension Service agent, or visit www.uaex.edu.